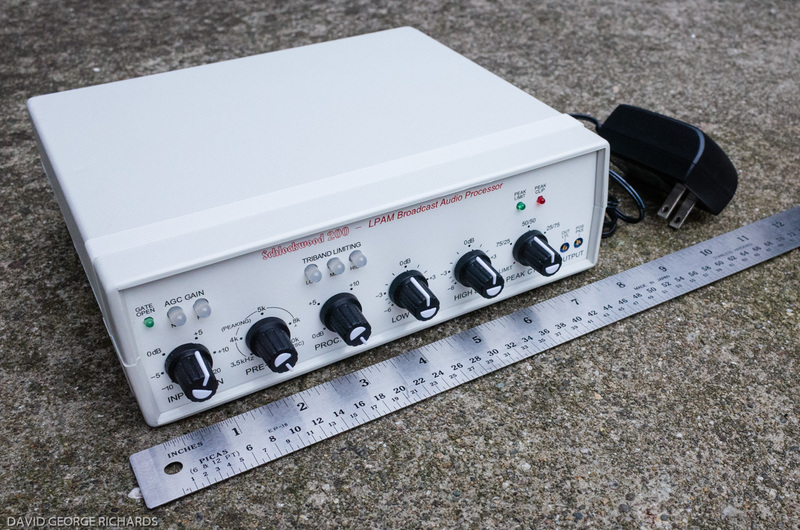 As Elecraft announces the availability of their KXPA1500, full legal power amplifier, it has become apparent that, as you peruse through their Order Page, that the Elecraft K1 has gone the way of the Dodo bird - it is extinct. You can still acquire some of the accessory band modules, the autotuner , the noise blanker and the back light modification kit; but that's about it. I would expect that declining sales; plus the problems associated with purchasing "through hole" components are what led to the demise of the K1. In the back of mind, I knew the day would come; but it's still a shock to see it become a reality. 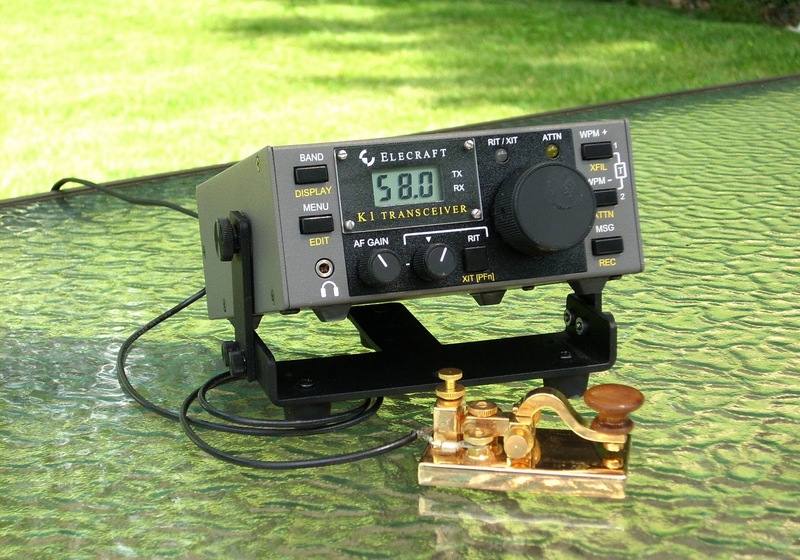 The K1 was the first transceiver kit that I purchased from Elecraft - in fact, the above photo is "my" K1. I very reluctantly sold it in order to afford my KX3. I don't regret having the KX3 as it's my dream rig; but I sure wish I could have found a way to afford it without selling my K1. So if you have a K1, give it a pat on the head for me tonight. Yesterday was very good day! 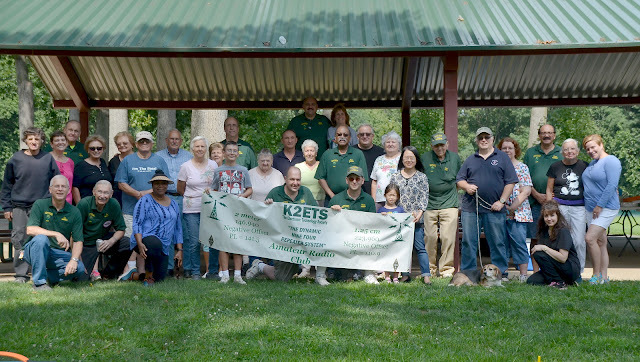 Once again, we were blessed with picture perfect weather for our Annual K2ETS Club Picnic. The food was excellent and the company was excellent and the day was excellent. If you look to the bottom right of the photo, you'll see Harold laying in the grass. He was basking in the glow of the limelight yesterday as just about everyone stopped over to say "Hi" and to pet him and give him attention - and even a few treats. I took him for a long walk and he must have enjoyed the day too, because he slept like the proverbial brick last night. I won the picnic door prize! Me, who hardly ever wins anything! I won a Baofeng 2M/220 MHz dual band handheld. My Wouxon 220 MHz HT, which I had purchased a few years ago, died recently. This is a welcome addition and I can keep tabs on our 220 MHz repeater. But the best surprise of the day was this. I arrived at the park early, around 9:15 AM in order to help out with setting up for the day. After sweeping out the pavilion where picnic tables were and then washing them down, it was time to put up the antenna. Every year we throw a wire up into the trees and we bring along the club HF rig for anyone who wants to operate. When it came time to put up the antenna, Dave KC2YRC said to me, "Come over here, we have a gift for you." I must have looked confused. He presented me with a new antenna launcher that he and his brother Dave W2OIL had made for me. They even painted my call sign on it. To say I was gratefully overwhelmed is an understatement. Flash back two years, when both Dan and Dave were at set up for SPARC's participation in the Rookie Roundup at Putnam Park in South Plainfield. 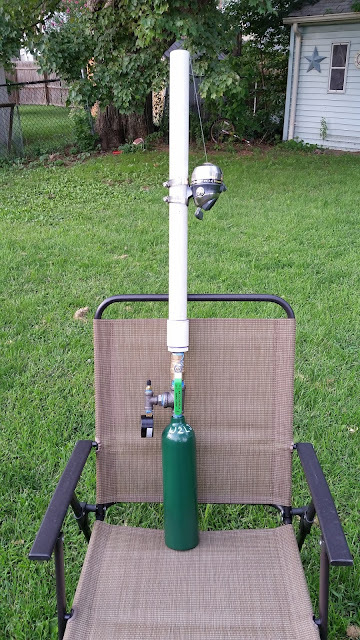 I was going to put up an EFHW into one of the trees; only to discover that the air chamber in my Joplin ARC antenna launcher had cracked on me when I must have dropped it at some point. I didn't even realize it until I tried to use it that day. I ended up supporting the wire with my 31 foot Jackite pole. Fast forward to yesterday, when they presented me with a launcher of their design with a used METAL (translate that to "unbreakable") oxygen bottle serving as the air chamber. In addition, they gave me a fancier (and much smoother) air release lever and they also installed an air pressure gauge so that I don't have to rely on the pump's gauge. I couldn't thank them enough! That they thought of me and had me in the back of their minds meant so much to me. These two guys, Dave W2OIL and Dan KC2YRC are the salt of the earth and have hearts of pure gold. They would do anything for anyone. They are just THE best and it is an honor and a privilege to be their friend. Anyway, after returning home, I just had to try it out. I went to an empty field and pumped it up to about 20 LBS of pressure and let the weight fly. Because the air chamber is a bit smaller than the chamber of the Joplin launcher, the weight didn't fly as far. A second shot, with the chamber filled up to about 35 LBS psi easily sent the weight over a (my guesstimate) 70 foot tree. That smoother release lever allows me to hold the unit steadier during launch, better enabling me to send the line where I want it to go. By the way, during the picnic, the club station K2ETS was reasonably busy throughout the afternoon. Talking with some of the other fellows, I discovered that we had worked several Kansas QSO Party stations, as well as stations from Germany, Brazil, Georgia (the country, not the state) and Oman. Not bad for 100 Watts to an off center fed dipole sloping from about 15 feet at the low end to about 55-60 feet at the high end. I feel badly saying this, considering what's transpiring in Texas - the weather here today was gorgeous! What a beautiful day! Sunny, with a high of 80F later in the afternoon and low humidity. Perfect for changing out the coax on the W3EDP. And that's exactly what I did; and it got done without incident or mishap. I used the 46 foot stub that I had made for Field Day for 80 Meters. After the cable run part was done, I was able to cut about 10 feet off that. I soldered on a brand spankin' new PL259 and was in business. I had other things to accomplish after that, so I wasn't on the air for long. I called CQ at the QRP Watering Holes on 40 and 20 Meters without result, but the Reverse Beacon Network let me know my signal was being heard. Then I listened to a ragchew on 17 Meters for a while before pulling the plug and getting to work on other things. Both HF antennas now have brand new, low loss coax runs. Hot dog! Before I begin, a shout out to all my friends in the path of Hurricane Harvey. Evacuate if you can, hunker down if you can't. Stay safe and don't take unnecessary chances. My prayers are with you. Last night was the first chance that I had to get on the air after switching out the coax on the Butternut. As I had mentioned in the Skeeter Hunt post, we were away last week on a college open house visit to Virginia. Between the "before trip" planning and the aftermath that always occurs when you get back home, I was radio silent. I thought that it would be a good idea to jump into the 20 Meter QRP Foxhunt. I haven't participated in it much at all this Summer, maybe only one or two sessions. I figured this would be a good a test as any. When I got home from picking up my daughter Cara from high school Color Guard practice, I went down the basement a hooked up the coax to the rig and plugged in the power strips. These were all still disconnected since we had left. Someday I'll tell you the story of the routine my wife and I go through before leaving the house on an extended trip. Talk about OCD kicking in! Anyway, I got everything plugged in, turned on and got the laptop to start the laborious procedure of booting up. I flipped the KX3 to "ON" and set the band to 20 Meters. I put the ear buds on and was greeted by ......... quiet. The background noise was lower than I was accustomed to. I thought maybe something was wrong. Had I possibly not soldered a PL259 correctly? But then I thought, "No, when I did the quick listen that Sunday, I heard stuff". So I twisted the dial and before I could even turn it a quarter of a turn, N0UR's signal came skyrocketing out of the background. So much quiet and then, "BAM!". It was like seeing a black lump of coal on a pristine white field of snow, or watching a firework blaze brightly against a dark sky. The contrast between Jim's signal and the lack of background noise was stark. I'm sure it was mostly just band conditions, but it was amazing, nonetheless. I got him in the log on the first try, and then it was off to hunt for K4BAI. Since I found N0UR, I knew I had to go to the other side of 14.060 MHz to find him as the Foxes always (most always) split up in to a High Fox and a Low Fox. So I twiddled and I listened, then I twiddled and listened some more. Finally, I heard a signal, but it wasn't John - it was a familiar call, one of the Hounds chasing him. Knowing how K4BAI operates (textbook and professionally) I tuned down exactly 1 kHz. There he was; but just the faintest of a faint whisper. My first reaction was that perhaps it was only going to be Jim N0UR in the log, but I decided to sit and listen for a bit. It wasn't like I had anywhere to go or anything else to do. Well, actually I did, but putting the dishes in the dishwasher could wait for a while. John's signal started to increase, slowly but surely. I thought at first that it was propagation changing and maybe that was part of it, but then I remembered that John owns a beam and he must be turning it North. Eventually, his signal rose up to about 569. Nowhere as loud as N0UR, but surely good enough to make a QSO! I gave John a call and again - an answer on the first try. Two Foxes in the books for the night. I know this itty-bitty sample is nowhere big enough to let me really evaluate how much a change in the coax has made. But so far it seems to be working well. Maybe it's just like getting your prescription changed in your eyeglasses. At first you notice the big change and then as you get used to it, the new prescription becomes the new "normal". I'll be more than happy if this perceived hearing improvement becomes the new normal in my shack. Although I use Log4OM as my logging program for my Amateur Radio logbook, I do own a registered copy of AC Log. As the Trustee of NJ2SP, I use it as the official logbook program for the South Plainfield Amateur Radio Club. "Why? ", you might ask, "It seems kind of stupid to keep two logbooks on two separate programs." Because of Scott's program's popularity, there are other AC Log users in the club so I keep a current N3FJP generated ADIF in the club's Dropbox file folder so that they all can have copies of the logbook, should they desire. And as universal as ADIF files are supposed to be, I have found that ADIFs work absolutely the best when you load one onto another computer that uses the same logging program as what generated it. - You can optionally display digital modes in the DX Spots list based on the frequency of the DX Spot (Click Settings > DX Spotting > Configure > More Filtering > Display Digital Modes to enable). You'll also need to download the latest BandPlan.txt file by clicking File > Download Country Files from AD1C. - AC Log now uses ARRL's LoTW User's list to identify LoTW users (an L is placed in the DX Spots list). Click eLogs > LoTW Users > ID LoTW Users to enable the feature. If you already have enabled the feature in AC Log 5.9, AC Log 6.0 will detect that you don't have the new LoTW user list on start up and download it for you with a single click. - The last LoTW upload date of the station contacted is optionally displayed when tabbing from the call field. (Click eLogs > LoTW > ID LoTW Users on Call Tab). If the station you are working has a recent upload date, that will give you a better sense if he is really active with LoTW or not. - Ability to update mode drop down lists without requiring a new release. So if you have a registered copy of AC Log, you can get the download for free by visiting his Website - http://www.n3fjp.com/index.html Just go to the "About Us" tab on the header and choose "Recent News" from the drop down menu and it will take you to the newest release. As I said above, personally, I'm a confirmed Log4OM user. It suits my needs so very well. I like it's looks, it's feel and they way it operates. It has all the features that I could hope for and I've become super comfortable with it. That being said, logging software is a very subjective matter. What works for me may very well not work for you. In any regard, AC Log by N3FJP is an excellent program as well. I would highly recommend it if you're not satisfied with whatever you're currently using. It's highly intuitive and easy to use; and if you've never used a computerized logging program before, AC Log might just be what you're looking for. Yesterday was the day of the Great American Eclipse. I wasn't thinking too much about it; as I was at work, where my desk happens to be in a room with no windows. I wasn't anticipating much of a view. Around 2:44 PM, when totality for NJ reached the peak of approximately 75%, I wandered out to the lobby, where I saw a bunch of people just outside the building, looking at the sun with eclipse glasses, cell phone cameras and the like. It just so happened that there was a light to medium cloud cover which totally obscured the Sun, at times. 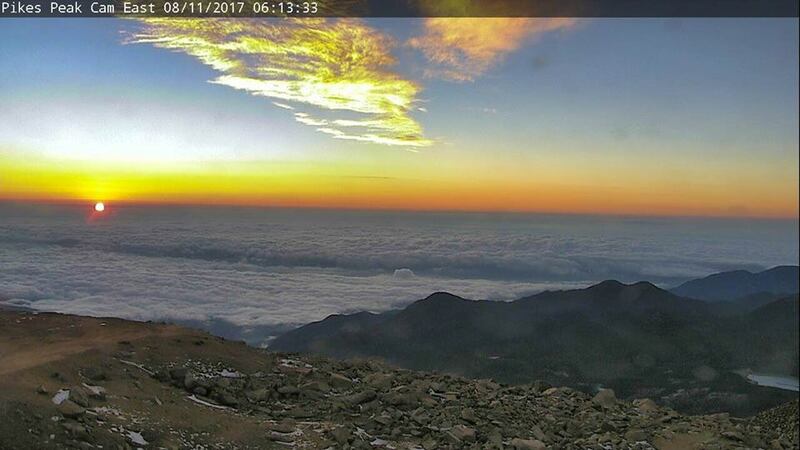 The silver lining to these clouds was that, when they got thin enough, you could see the Sun/Moon do their tango for a few seconds without even squinting or straining your eyes in any fashion. So I got to see the great eclipse of '17. I don't much remember the 1979 eclipse; but I do remember the 1972 eclipse pretty vividly. I set up the 4" refracting telescope that I owned at the time, to do a projected view onto a white screen. I took pictures and I know that I still have those, somewhere - probably mixed in with all my Apollo program ephemera and miscellania. The post title has to do with antennas, once again. The "One Down, One to Go" title means that this Saturday, I am hoping to replace the coax to the W3EDP antenna. This is a much shorter run than the Butternut. The W3EDP is anchored by a second floor window which is more or less directly in line with the window that serves as my entry point to the shack. I am anticipating that a run of coax probably no longer than about 30 feet will be required. I am looking to replace the RG-8X with the LM-213 that I purchased to serve as coax stub filters for Field Day 2017. I figure I can always buy more coax for a replacement filter next year. In the meantime, the band pass filters that I ordered from QRP Labs arrived yesterday. I will build those over the Winter and will combine them with stub filters, if necessary, next Field Day. With the W3EDP coax replaced, both antennas should be set for the next decade or two barring any critter damage. Labels: antennas, homebrewing, kitbuilding, misc. 2017 NJQRP Skeeter Hunt - my sincerest apologies! Thank you to all who participated in the 2017 NJQRP Skeeter Hunt yesterday. So far, from the log summaries and soapbox comments that I have received, it would seem you all had fun despite the crummy band conditions. I apologize for not being able to participate and work many of you this year. I was stuck on I-95 yesterday for almost 10 hours, returning home from Virginia where we took our son Joseph on a college visit. I thought I might get home in time, early enough to catch the last part of the Hunt; but it was not to be. Please remember that log summaries and soapbox comments are due NO LATER than Midnight, Sunday Night September 3rd. You can send them to w2lj@arrl.net. Each log summary received will be answered by a confirming e-mail - so if you don't hear from me within a day or two, please try again! Before I go into today's blog post, I have to mention that for Catholics, today is the Feast Day of St. Maximilian Kolbe, SP3RN. 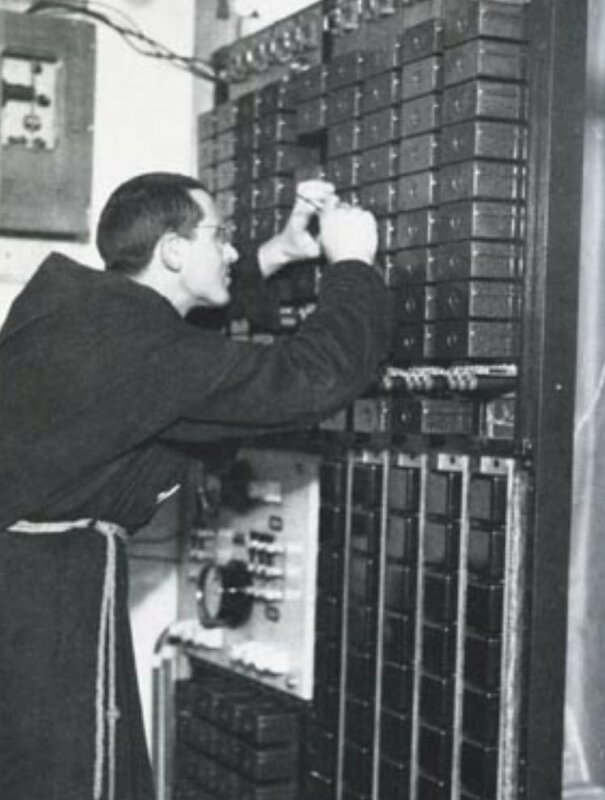 St. Max was a Franciscan Friar who was interned at Auschwitz during WWII. After three prisoners escaped, the Camp Commander responded by sending 10 prisoners to their deaths by starvation. One prisoner plead for his life as he had a wife and children. Upon hearing this, Fr. Max asked to take that man's place. His request was granted and he was the last of the 10 to survive. Maximilian was injected with carbolic acid to end his earthly life on August 14th, 1941. 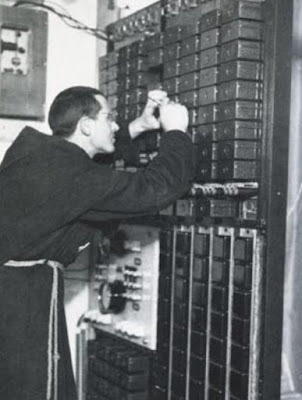 Catholic Hams have fondly and unofficially taken St. Max on as our patron saint, the patron of Amateur Radio operators, worldwide. St. Max, ora pro nobis! They say that confession is good for the soul - so I will confess. Yesterday, I replaced the coax running out to my Butternut HF9V. The coax has been there for umpteen years since I put the vertical in place in 1999, about a year before my son Joey was born. It's been a while now that I've wanted to replace the coax and last Autumn, I purchased some 9913 from DX Engineering, My good intention was to run that coax out to the antenna before last Winter began. You know what they say about good intentions. Yesterday, the weather for the chore was about as near perfect as it gets. It was sunny, warm, but not hot, with a slight breeze and low humidity. I began by putting on the work gloves and pulling up the old coax. It's been such a long time since I put that coax down; and I was mortified by what I discovered. Connected to the Butternut's matching stub was a barrel connector and then a 100 foot run of LM-213. At the end of the 100 foot run was another barrel connector and a 25 foot run of some more LM-213. Then, as if that wasn't bad enough - there was yet another barrel connector and a final 25 foot run of RG-8X leading directly to the operating bench. What the heck was I thinking?!? This was coax hack job of the century! I still can't believe that I did this; and if I hadn't seen it with my own eyes, I would never have believed that I could do such a sloppy, piecemeal job. The only thing that I can think of was I was so tapped out after purchasing the Butternut, that I just used whatever coax I had on hand to get the job done. All those barrel connectors! All that loss! I must have had an ERP of about 2.5 Watts! 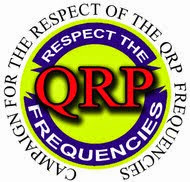 It seems a miracle that I made any QRP contacts at all, let alone all the DX and states I have worked with that cockamamie set up. I am truly amazed at what a lousy job I did - EXCEPT in one respect. When I removed the electrical tape covering up those barrel connectors and their accompanying PL-259s, they were as shiny and new looking as Day One. And I owe that to an article I read somewhere, way back when, maybe it was on QRP-L. When I made those connections, I first wrapped the coax and the connectors with electrical tape. Then, I covered that with a layer of plumber's putty. The plumber's putty was followed by a final layer of electrical tape. After some 18 years, the connections were bright, shiny and there was NO sign of any water intrusion, whatsoever. And considering the coax was laying on the ground through some very harsh Winters and at least three major Hurricanes, Floyd, Irene and Sandy, that's pretty darn good. There was one section where the jacket of the LM-213 got chewed up pretty badly from lawn mower hits. 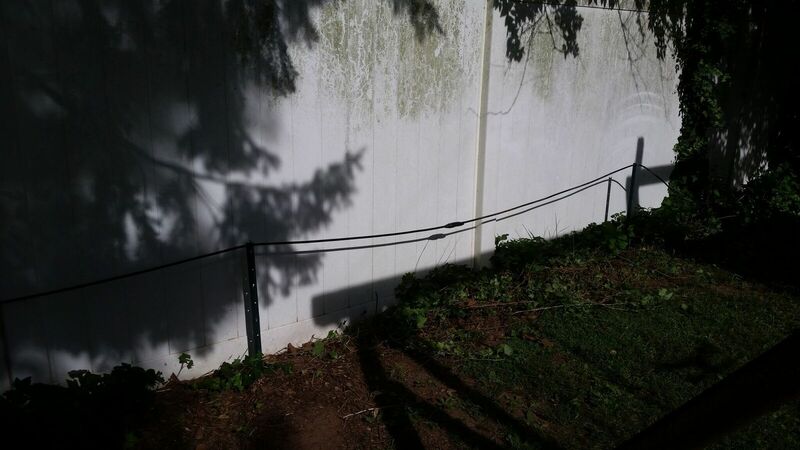 To prevent that, this time I elevated the coax as it ran along the back fence. I used garden fencing stakes, spaced out at about 5 foot intervals and I cable tied the coax to the stakes to keep it off the ground and away from the angry blades of my coax eating lawn mower. Once I got to the chain link fence running along the side perimeter of the yard, I then cable tied the coax to the top tube. My new run of one piece of 150 feet of RG-9913 is safe and sound from gasoline powered lawn tools! There's only one barrel connector, where the terminus of the coax meets the Butternut's matching stub. and you can see that little lump in the picture, above. Now maybe I'll get a bit more of that precious 5 Watts into the antenna and out into the aether. Later on, in the afternoon, after getting home from my monthly volunteer stint at the soup kitchen, I soldered on the PL-259 to the radio end of the coax. I plugged it into the KX3 and was happy to see a VERY easy match made by the autotuner on all bands. Maybe a 1/2 to one second "BRRRRP" by the relays in a few cases, and in the rest, there was no match needed at all. There's peace of mind knowing that I now have a proper run of low loss coax out to my vertical. I'm also going to change out the coax to the W3EDP. That's a straight forward exchange, and I figure that as long as I'm doing one, I might as well do both. I'm happy to state that the coax currently running to the W3EDP is not a hack job conglomeration like what was running out to the vertical ! I'll NEVER do that again and like they say on all those shows on TV = "Don't try this at home!" I have to admit that I am more than "sorta" envious of those Hams who activate the SOTA summits. I look at photos like these from Steve WG0AT, and I'm just beside myself, admiring the beauty of the landscapes and the tenacity of those who go to these places. Yeah, there are summits in New Jersey (EVERY state has a few), but they're nothing like these. Well, according to geologists that I have read, the Appalachians were once taller than the Himalayas at one point, but that was about a bajillion years ago. 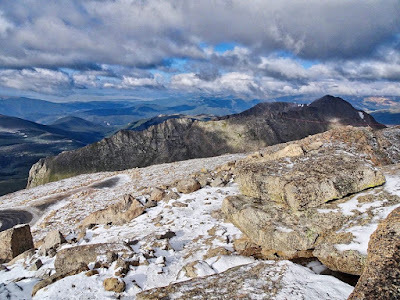 What we call mountains here on the East coast are mere hills compared to the Rockies. I've been fortunate enough to visit the Rockies and even come close to the Alps in Switzerland, so I can affirm that comparison. Instead, with the limited time that I have to devote to portable ops (employed full time with a mortgage and two kids going off to college soon), I resort to POTA and NPOTA (when it was active) for my outdoor venues of operation. Because those opportunities present themselves so seldom, I like to take the moment to enjoy the place that I am operating from. No long hikes to summits with beautiful vistas of multiple states present themselves to me; but in the parks that I do go to, I am surrounded by nature and beauty all the same. There's something special and wonderful about being bathed in sunshine and fresh air, and seeing trees, and listening to the sound of the breeze rustling through their leaves, while at the same time watching and listening to brooks, streams, rivers, wild life and what have you. Whether you're perched on a mountaintop or operating your QRP gear from a picnic table in the local city park, I would hope that all portable ops mavens take the time to enjoy the beauty of their surroundings and not dismiss that beauty for the tunnel vision of just chasing QSOs. Portable ops should be about way more than just a bunch of QSOs. Heck, I can do as much from my cinder-block-walled-in bunker of a basement shack. Don't miss the forest for the trees! Take the time to smell the roses. 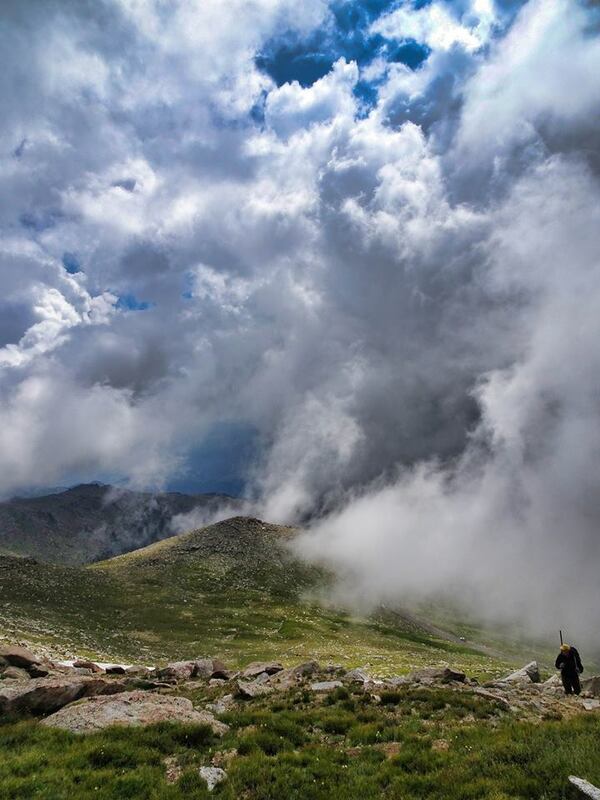 Take a moment to breathe deeply, enjoy the fresh air and Nature in all the glory of your surroundings! Life is precious - enjoy it and revel in the moment. And should you not make any QSOs, don't be disappointed. You had the opportunity to go and be somewhere that is beautiful, and that is far more precious than just making a few contacts on the radio. As a confirmed Elecraft owner, I have no skin in this game; but am always willing to do whatever I can to promote portable operations. Last night, I was asked to run the monthly county ARES net. After that I attended our Assembly's Knights of Columbus 4th Degree meeting. A pronouncement has come from K of C HQ in Connecticut which has not gone over well with the membership. I won't bore you with the details, but the meeting was interesting. When I returned home, I went down the basement to add a link to the Skeeter Hunt roster on the Skeeter Hunt Website. While I was doing that, I decided to join in on the monthly NAQCC sprint. A few weeks ago, I received my W2WK straight key, so I decided to take it for a spin. The key is a beauty, a sight to behold. The action and feel are superb. My fist is not. Sadly, I've gotten so comfortable with paddles and keyer that my "manual" fist has atrophied. It improved a little bit as the night went along; but I have to publicly apologize to the NAQCC members who worked me last night. You know your fist is bad when you feel yourself grimacing while you're sending. I think that if you looked up the word "ugly" in the dictionary, there would have been a picture of me behind the key last night. I am terribly sorry for my crummy fist and the torture I put you through. I need to practice more and hopefully, by next month's sprint, I will sound a whole lot better. When you've hit rock bottom, there's no place to go but "up". It seems like there's never been the bonanza of QRP radios available like there are today. What follows is not an accurate timeline, just impressions upon my memory. 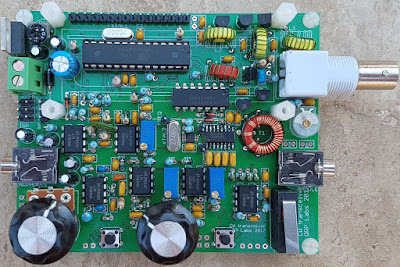 For years, you had the Ten Tecs and the Heathkits, the SGC and QRP Index radios and various homebrew rigs. Then came the Sierra's and the Small Wonder Labs offerings and then Elecraft burst onto the scene. IMHO, ever since Elecraft, it seems like there's been a non-stop parade of introductions of commercially available QRP radios. And this is a good thing. More people are tossing there hats into the ring, and the offerings are becoming numerous. Competition is a good thing and the various models are a benefit; as no one radio will fit everyone's taste, style or operating habits. 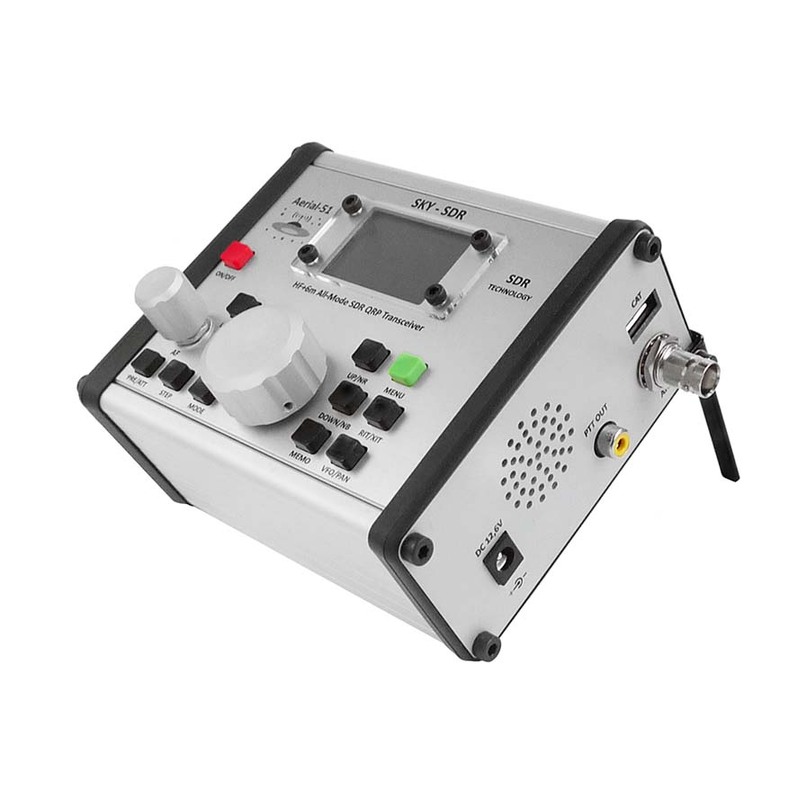 This 11-band All-Mode QRP transceiver is manufactured in Europe and combines SDR / DSP "Direct Conversion" technology with ease of use. 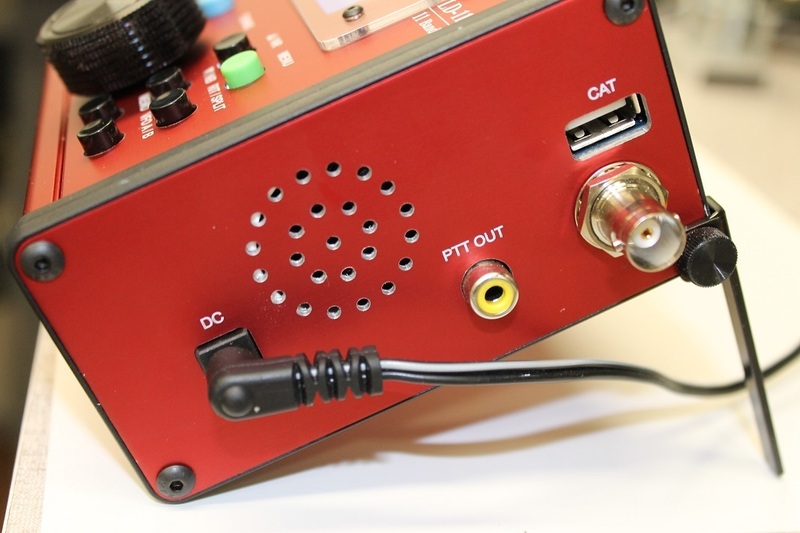 The device does not require a computer to operate, has almost all the characteristics of a "large" SDR transceiver and is thus particularly suitable for demanding QRP and portable radio operators. The future-oriented RX is equipped with all common DSP functions, eg user-definable (extremely steep) filters, noise reduction (NR), noise blanker (NB), adjustable AGC, and audio equalizer. 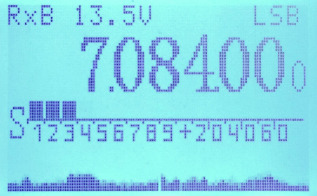 The built-in BANDSCOPE shows 24 Khz above and below the QRG and also works with TX. 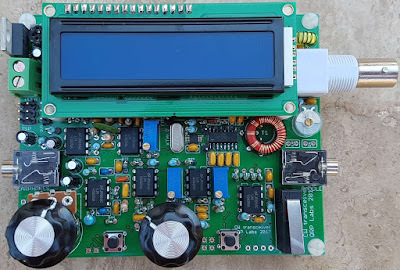 An outstanding feature is the "differential ADC" or "differential DSP" It provides very low noise on reception, which is particularly noticeable on the lower bands 160-40m. 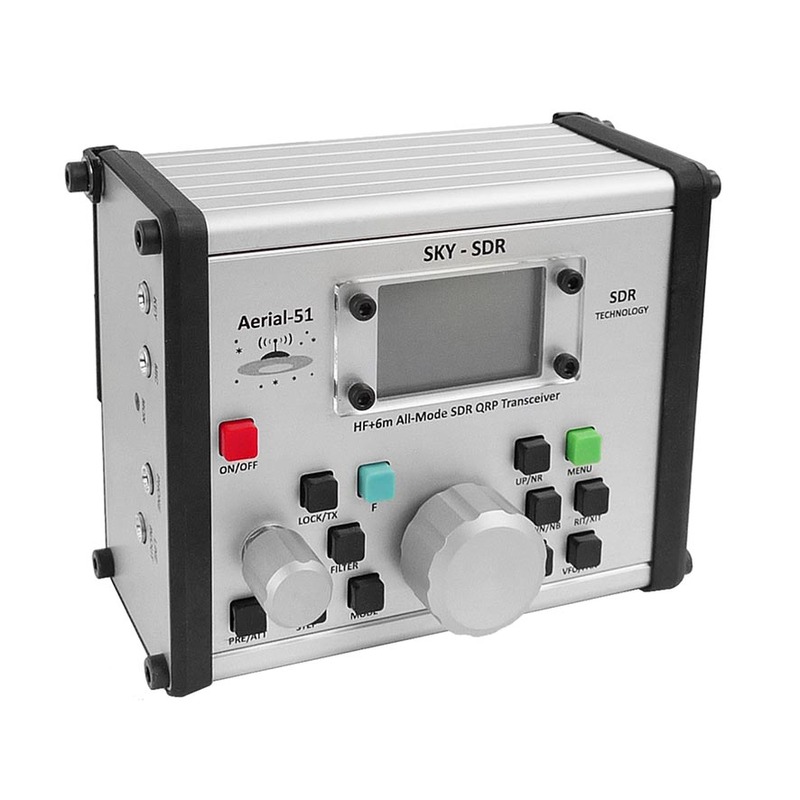 The SKY-SDR transceiver is also characterized by a clean TX. It comes with hand-held microphone, voice processor, audio equalizer, VOX, SWR & Power Meter, built-in keyer (A / B mode) and dual-mode CW (CW / CW reverse). AM, FM and DIGI modes are also supported. The device has a USB CAT port (with FTDI), LINE IN / OUT for DIGI Modes, and an I / Q output for computer monitoring. Perhaps the only QRP radio with built-in band scope. This and other unique features make it the most interesting QRP radio in the world. Modes AM, CW, DIGI, FM, LSB, USB CAT: USB2 (FTDI Chip) Digital Modes JST, PSK, RTTY, SSTV, etc. First impressions - it seems to be almost an exact copy of the LNR LD-11 radio. The specifications and similarities are strikingly similar, in many areas. However, the LD-11 claims to output as much as 8 Watts, while the Aerial-51 claims to output 5 Watts, max. Despite the difference in output claims, I'm wondering if they're the same radio in slightly different housings. The Aerial-51 is priced at 739 Euros, which translates to $871 US. 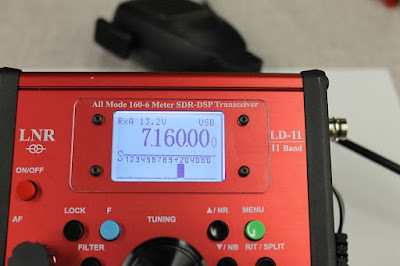 The LD-11 from LNR is priced at $790, but seems to be out of stock at the moment. The other thing which caught my eye was the statement, "Perhaps the only QRP radio with built-in band scope." My mind immediately went to the mcHF radio, which has a nice, full color waterfall display. Perhaps, "one of the few QRP radios with a built-in band scope" would have been more accurate. Like I said, so many rigs to choose from - we QRPers have never had it so good! I think I have mentioned this before. A quote from Robert Burns, "The best-laid plans of mice and men often go awry". That described my yesterday. My plan for the day was to replace the coax to the HF9V with the 150 feet of RG213 that I had purchased from DX Engineering last Autumn. I was just about to get started when my wife Marianne called out, "Larry, there's something wrong with the washing machine!" Sure enough, she had loaded the machine and was about to start a wash cycle, and it filled partially and then just ........ stopped. Dead in its tracks. Step 1 - Cancel the cycle and get the water out of the machine. Step 2 - Remove partially wet laundry to a basket so that my XYL could take it to the local laundromat. Step 3 - Breakout the laptop and Google and YouTube. These machines are so sophisticated these days with microprocessors, control boards and touch panels. Gone are the days when all you had was mechanical timers that regulated and controlled the wash cycle. Luckily, through Google, I found a YouTube video which described how to run a diagnostic on the washing machine. It boggles my mind to even write "run a diagnostic on the washing machine." Anyway, I did that and got a F51 error which seemed to indicate a problem with the rotor position sensor, whatever the heck that is. An accompanying article suggested unplugging the machine for two minutes to clear out the capacitors on the control board in order to reset the microprocessor, and then run a wash cycle, as a first attempt to fix the problem. I grabbed a few dirty pieces of clothing and tossed them in the machine along with some detergent. Fingers crossed, I closed the lid and punched the proper buttons. Everything worked! It seems the problem is solved with the exception that the spin cycle seems a bit louder than it used to. A new rotor position sensor runs about $100, so if it eventually gives out and we get the same error again, I'll order one of those and will give it a go. "Any standard PL-259 fits LMR-400 exactly, and perfectly without any modification to the cable or the connectors. 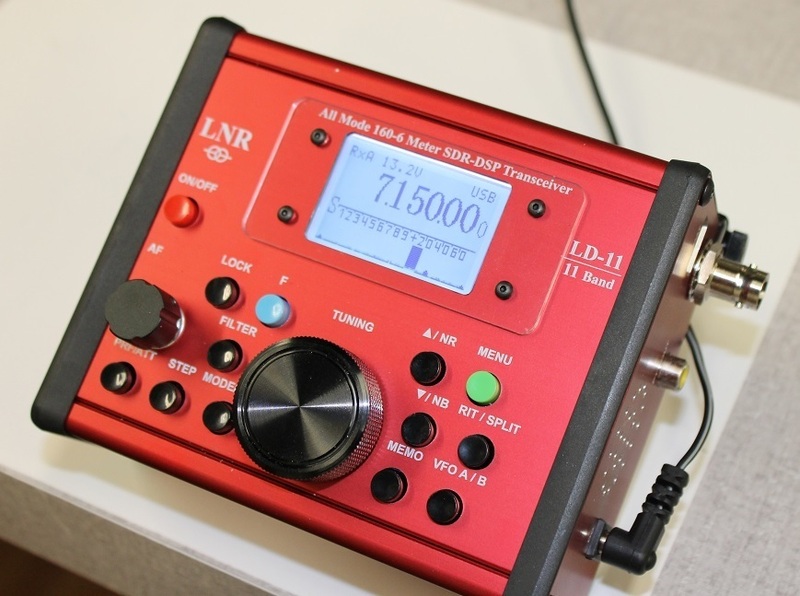 I've installed hundreds of these on LMR-400s and use ordinary Amphenol 83-1SP PL-259s. You *don't* peel back the braid of LMR-400 for this operation, where'd you hear that? That won't work at all. The correct procedure is the same as installing a PL-259 on regular RG-213/U. The braid must remain in place exactly as it was originally, and the only thing you strip is the black vinyl jacket. Leave the braid right where it was, under the jacket and tightly braided over the foil. The best way to prepare the LMR-400 cable end is with a sharp (new) single-edged razor blade, cutting through the vinyl jacket, braid, foil and dielectric all in one single slice and leaving only the center conductor, stripping all else (with a single cut) back about 3/4" from the end of the cable. Now, you have a copper plated aluminum center conductor sticking out and the rest of the cable fully intact. Now, measure back 1/2" from the edge of the vinyl jacket and use much less pressure to strip only the jacket, and leave the braid, foil and dielectric intact. This only takes gentle pressure, not the several pounds the first "strip" requires. Push the PL-259 over the end of the cable so the center conductor protrudes through the end of the center pin and when you hit an obstruction, that will be the cable jacket hitting the internal threads in the PL-259 body. Rotate the PL-259 body clockwise while applying gentle pressure to the connector, and it will screw itself on to the cable jacket. About four full rotations are required to fully assemble the connector on to the cable, and when you're done, it won't twist on any more, and you'll see the braid showing through the PL-259 body solder holes. This entire process takes fifteen seconds if you know what you're doing. It can take forever, and never come out right, if you don't. I am hoping and praying that the weather next Saturday is good and will allow me to get this done. As of right now, the forecast is for a cloudy day, but with very low chances for rain. I'll take it. If I can that done and the coax on the W3EDP exchanged out, I will be happy camper. "Sun Aug 06 2017 8:50PM - It doesn't get much harder than this. I hate to make a DX station work so hard to get me in their log, but some folks have a tremendous amount of patience and will stick with someone till the QSO is complete. They will put other station trying to break in 'on hold' so to speak and continue to work with the one station till he is in the log or it becomes hopeless. That pretty much describes what happened between me and SP5ELA on 40M a little while ago. It must have taken about 2-3 minutes for him to get my call, but he didn't give up. I guess I must have sent my call about 30 times before he got past K3W and finally sent K3WWP TU 559. Thanks to him, the DX streak goes yet another day." What caused me to laugh was when I saw the station he was trying to work, SP5ELA and then going back to his words - "but some folks have a tremendous amount of patience". I had to send him an e-mail basically telling him that, being of Polish descent myself, I'm not sure if it was a matter of patience so much as it was probably more of a matter of stubbornness! I've always been told by my grandparents that stubbornness is a trait common among the Poles. And I find it true with myself, once we start something, we're not likely to give up on the task, no matter how long it takes! 23 years under his belt! As my regular readers know, I often mention John K3WWP here in the pages of this blog. No doubt, I'm a fan of his. John is a "QRPer's QRPer". His whole Amateur Radio career revolves around QRP, Morse Code and simple wire antennas. 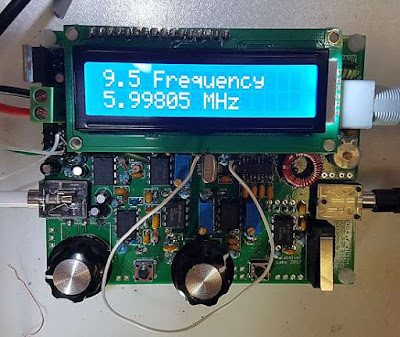 He is dedicated to showing that you do not have to have an overly elaborate set up to enjoy Amateur Radio; and that in fact, it can be done with very moderate or even meager means. He is dedicated to showing how much fun and rewarding all this can be. If there was ever anyone who deserves to be in the QRP Hall of Fame, without a doubt, John Shannon K3WWP deserves to be there. Tonight, John will embark on trying to begin his 24th year of making at least one QRP CW contact s day. Allow your mind to wrap around that. It's easy to read it, it's easy to say it. But take some time to think about that. That is over (not sure how many Leap Days are in there) 8,395 daily QRP QSOs in a row, completed. Over 8,395 days uninterrupted. That's quite the feat when you take into account all of the multiple solar lulls, CME's, solar flares, bad weather, equipment mishaps, and personal circumstances that could have easily ended this streak early on. Nevertheless, John endures and persists through it all, and continues to make the QSOs - with 5 Watts, or less. I'm sure this streak will never be equaled or surpassed. It will probably never make the Guiness Book of World Records, or even be acknowledged by those outside the QRP Community. 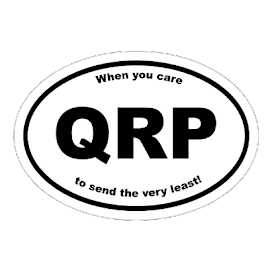 But it's there and we know, for a fact, what can be done with QRP. 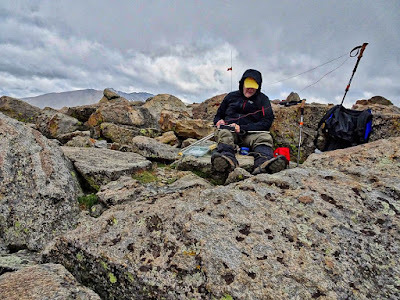 So the next time someone tells you that QRP is a joke, or it's a waste of time, that it's a matter of luck and not skill; or that all the success is totally due to the receiving station, OR that "Life's too short for QRP" ....... stand fast and unwavering and think of John K3WWP. 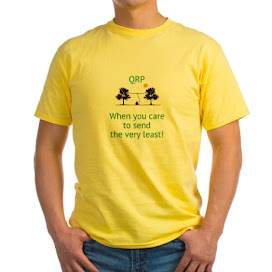 Chuckle quietly to yourself and move on, knowing that the power and worth of QRP and CW have been more than adequately proven - over 8.395 times in a row. 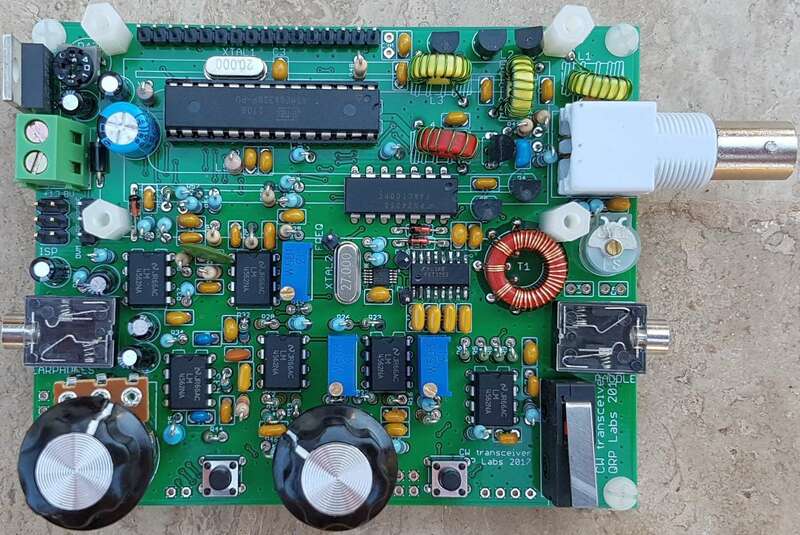 From QRP Labs (Hans Summers - with whom I've had the pleasure to work on the air) - a 5 Watt Transceiver Kit. Yeah, I know what you're thinking, "5 Watt transceivers have been done to death!". Well, look at this one! While I was there, perusing around, I purchased his passband filters for 80, 40, 20 and 15 Meters. Those will be used next Field Day in conjunction with the coaxial stub filters for even more isolation between our stations. Lots of good stuff available at QRP Labs!